To pass from Rio Témpanos to the Pacific by the approved route it is necessary to return northwards to Paso Tres Cruces, 45°48'S 73°40'W and then turn west. But the adventurous might send the boat the long way round, traverse 15 miles southwest on foot and rejoin it at Bahía San Quintín to continue the journey south. This section deals with links from Canal Errázuriz to the Pacific, the outside passage to Golfo de Peñas and anchorages on the north side of that Gulf. UK 1288 US 22371 Chile 842, 846 On a southbound trip, there are two possible routes out from Canal Errázuriz, which is a continuation of Canal Moraleda, to the Pacific Ocean. The northern route is through Canal Darwin, and the southern through Chacabuco and Pulluche. For most yachts the southern route is preferred. There is little shelter at the western end of Canal Darwin, and it is a much longer run to the south to the Puerto Refugio area than if an exit is made through Bahía Anna Pink. Exiting Canal Pulluche through Boca Wickham and then into Bahía Anna Pink can be very uncomfortable in strong west winds. The state of the sea breaking on Punta Wickham gives a good idea of conditions in Bahía Anna Pink and beyond. Estero Gori looks an obvious anchorage, but the entrance is in fact blocked by foul ground. The seaward approach to Canal Darwin is more straightforward than the approach to Canal Pulluche and may be preferable if coming from the south in poor visibility. Puerto Yates (see below) is a sheltered anchorage 5 miles from the entrance. On the south coast of Isla Quemada, Caleta Morgane is a pretty anchorage with a river at its head. Good holding in sand. Beware the rocky shallows. On the northwest corner of Isla Marcacci, well sheltered from all winds. Anchor in about 8m with lines to trees. There are sea lions and otters in the anchorage but plastic rubbish on shore. Puerto Yates is a good place to wait prior to exiting Canal Darwin or a place to rest after a long offshore passage from the south. 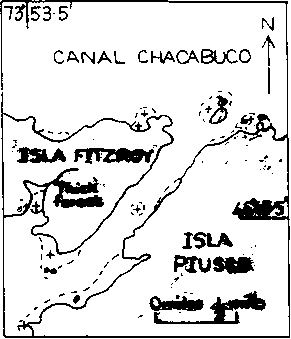 It is located 3 miles down Canal Williams, on the western side of Isla Rivero. 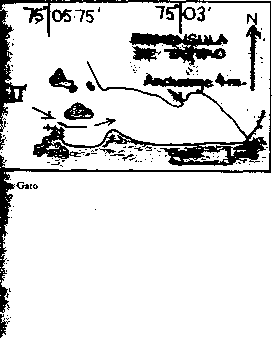 Chart 841 is detailed, the entrance is easy to find, even under radar. The holding is good on a sand bottom in 14m. south and south west. It is best to anchor as close to the head of the bay as possible with a line ashore. The bottom is sand, but the holding is reported to be only fair. Caleta Jacqueline is the unnamed caleta shown at the extreme western end of Bahia Harchv, 4M west ^pf Punta Harchv and at the southern mid-point of , Jsla Humos. The entrance is easily identifiable from by the pale coloured beach just S of the entrance. Although the bay appears to be open to the E, the * shelter is better than it looks because you can tuck 'ground the point to the N. There is considerable ■ kelp in the bay which can be by-passed. Either $nchor where shown, 6m, good holding, or go to the waterfall with a line ashore which may be more & sheltered. There are often small pieces of pumice on the beaches and in the surrounding waters, k fishermen consider this the most secure anchorage i this sector. it is well marked by kelp. The rest of the canal is free of dangers. Anchor in the small bay, 6m, sand. The bay is very sheltered even when strong winds are blowing from the north. Estero Balladares is a long fjord off Canal Pulluche. It is very important to move with a favourable tidal current in Canal Pulluche as the flood tide in this area can run up to 4 knots and Balladares is a good place to wait. It provides good shelter and the holding is good in about 10m but is subject to strong rachas. Some protection from these can be gained by tucking in behind the headland of Punta Laurel. The two streams on the north side have good drinking water. The western stream has many Copihue, the national flower, beside it; Aguada, the eastern stream, was a watering point for ships. In settled weather it is possible to anchor at the head of Estero Balladares which is very beautiful. Holding in very soft mud in about 7m. On the south coast of Isla Guerrero, about 2-5 miles from of 1563-5Isla Ricardo light (45°49'-4S 74°28'-6W Fl(4)6m4M White GRP tower Red Band 4m) and Punta Wickham bearing 202° approximately 1-5 miles away. Open to the SE but otherwise good shelter. Lines ashore in SW corner. Tide sweeps into the bay on the flood and it is possible that some swell might too if it were rough outside. Estero Clemente, the long fjord running into the southern end of Isla Clemente (see chart 817) provides shelter either in a bay half way up the western side or at the very head of the bay in Puerto Millabu. Isla Clemente is easily identified on the northern side of Bahia Anna Pink as it is an island of large barren mountains dominated by Monte Haddington. Puerto Millabu, at the head of Estero Clemente is a beautiful harbour with sandy beaches and a spectacular waterfall, Cascada Salmon. The bay, a shallow indentation, is in front of some old tent posts below a saddle in the hills. A good place to wait for the weather but subject to rachas. Good fishing. 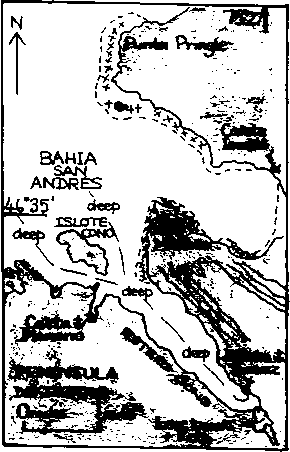 Dach ie east side, the ground south of Punta Salida >al with half a dozen small islands. 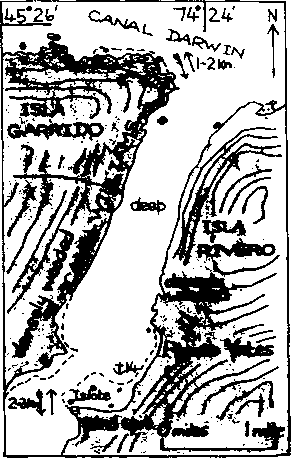 The deep lies west of southernmost, Isla Picnic, which 1« pole beacon. borage i holding is good in about 15m at the head of the ¿ Anchor on the west side off a small beach with : off-lying rock. It can be squally so take a line e. Watch out for the delta of Rio Casma on the least side. ¡«mentioned earlier, the state of the sea breaking [ Punta Wickham (45°50'S 74°33'W) gives a good of conditions in Bahía Anna Pink and beyond. Anna Pink. Care should be taken at the west end of Isla Larga as rocks extend out from the southwest end of the island and from the headland on the mainland opposite. Keep mid-channel to avoid these dangers. 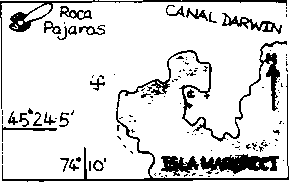 It is about 72M from 1563Isla Inchemo (45°48'-4S 74°59'-2W F1.12s31ml2M White concrete tower 4m 231°-vis-l 18°) to Cabo Raper (see below) and a further 20M to the first possible anchorage in the Golfo Tres Montes. From Raper to Isla San Pedro is about 72M. Between Inchemo and Raper there are the following possible refuges. The Puerto Refugio area is a spectacular amphitheatre with big mountains with steep, barren slab faces. Several hard climbs have been made on these slabs, notably by the crew of the British yacht, Pelagic. 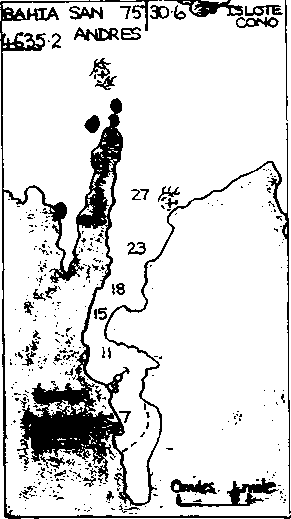 There are four recognised anchorages in this area as shown on the detailed Chilean chart 807. Puerto Refugio itself does not afford much protection. Caleta Lobato runs off to the north east. There is a good anchorage in 12m about halfway up the caleta. 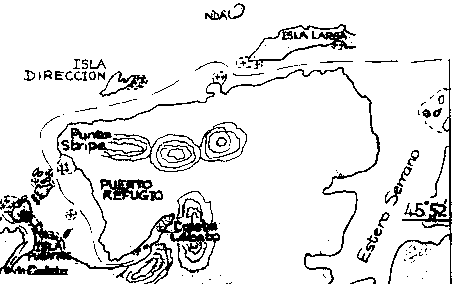 The entrance to Puerto Refugio and then on to Caleta Lobato is between the rocks southwest of Point Stripe and Isla Hyatt. 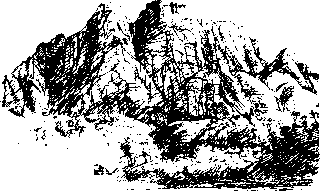 Considerable care has to be taken as there are many rocks and islands in the area. The second anchorage is Caleta Canaveral. This is a long well-protected fjord surrounded with low-lying wooded hills backed by the large mountains of the Puerto Refugio area. It is a first class refuge. The entrance is to the south of Isla Puentes. Approach from the NW keeping clear of the prominent rocks off the northwest end of Isla Puentes. The approach is then midway between these rocks and a prominent separate rock west of Isla Puentes that should be left to starboard. There is good depth all the way into the caleta which is approximately 1 mile long. 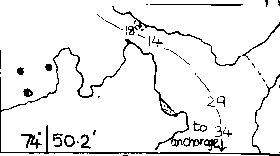 Anchorage is at the head in depths of 12-15m. The holding is rock and thin mud so make sure the anchor is well set and take a line ashore if necessary. The caleta is oriented NE/SW, but when the wind is from the W to NW there is still considerable gusting down its length because of the mountains on both sides of the caleta. The third anchorage is at the head of the unnamed caleta immediately to the northeast of Peninsular Gallegos. The entrance is to the south of the island in the centre of the caleta. The fourth anchorage in the Puerto Refugio area is Caleta Patch. Although recommended by fishermen it is more exposed than the other anchorages. This Seno is immediately to the north of Seno Bums and might be considered as the northern arm of that Seno except that its entrance is separate. The entrance is clean although would be subject to swell if a big sea is running. 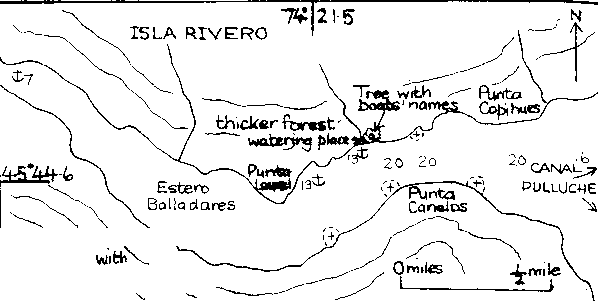 Once into the northeast reach, steer for the northeast entrance point of the caleta which runs back to the west. This point has an islet off it. 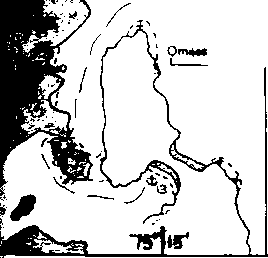 There is an anchorage in a wooded indentation just to the west of the point with the remains of fishermen's lines around the shore. The bay looks open but is surprisingly sheltered. The bottom is rock so a fisherman anchor might be advisable, along with lines ashore. There may be other anchorages in the Seno, though the head of the bay which runs back west is reported to be subject to rachas. Hugh the bay appears on the chart to be open to Ibest, it offers better shelter than might be peed because the islands and points at the close if off considerably. Swell does not •to penetrate and in a strong westerly, the H'within the bay might be more of a problem ■¡jgwell from the sea outside. When approaching, Kland northwest of the entrance appears to be J|t one mile further west than shown on chart at approximately 75°05'-75W by GPS. The liwest entrance point has visible rocks off it with Pjfeers but a mid-channel course is free from jprs. Two anchorages have been tried. Half way Rbay on the north shore there is a point with a Photch behind it with an anchorage in 6m, mud Je, with lines ashore. Alternatively anchor lie beach by a stream with lines ashore. further in on the eastern side just prior to the stream. Fishing boats tie up on the western side against a large prominent flat-topped rock. In strong west- to northwest winds the gusts can be prettv severe through the narrows, but not further down the caleta. This is a 2-5M caleta oriented northwest to southeast. The anchorage is a small bay behind a narrow wooded spit at the southeast end of the Caleta. The approach is easy with deep water nght to the edge of the spit. Anchor in about 12m in mud and take stern lines ashore. Protection is perfect from northerly winds and in strong southerly winds extra lines from the bow can be set up. Water from the stream at the head of this bay. While waiting for good weather it is possible to walk the length of the east shore. Where the caleta begins to open out, near a rock pinnacle, there is a large rock pool, good tor a swim on a warm day. In addition there is a shallow inner lagoon with a lovely sandy beach at the head of the caleta. The whole area is excellent for sea and woodland birds: buff necked ibis, black oyster catchers, ashy-headed and upland geese on the beach and with steamer ducks, blue-eyed shags, and magellanic penguins on the water. The woodland edges reveal the green-backed firecrown, beautiful hummingbirds and flocks of noisy austral blackbirds. The flora at the edge of the forest is reminiscent of an English garden with many familiar species such as hebe, fuchsia, pernettya and gunnera, the giant rhubarb, all growing in wild and natural profusion. Râper, (46°49'-2S 75°37'-4W il7M White round concrete tower and 14m 331°-vis-175°~) lies between Bahía San "and Puerto Barroso. Râper should be called jel 16. They will provide a pronostico for the : Peñas. Barroso is a good place to stop when south to north if adverse condition are red when approaching Peninsula Tres . 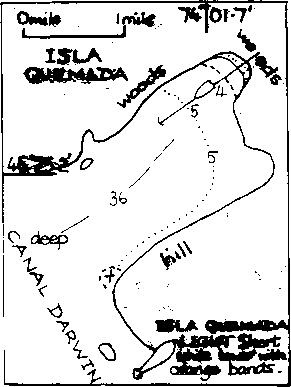 Anchor in the outer bay with the holding in rock or proceed to the inner bay passing of Isla Block as shown on the sketch plan. [ holding and well-sheltered. Good holding is reported off the pier. The Armada maintains a presence here and there are thermal springs at 40°C. About a two and a half mile hike to Cabo Raper. A deep inlet with good all-weather properties. Quiet if drawn in close to the shore, stern lines to trees, in the inner northeast arm between the tree side and the gravel fan of the waterfall. The south arm has good holding but may be disturbed by rachas. Named Omega by Knick Pvle because of its shape, it has good shelter except from the southeast. Favour the east shore on entering. Some protection from the southeast can be obtained by tucking in behind the spit which extends from the west shore at the entrance. Sand and pebble bottom. Nearby is the barren island Islote Amarillo with a large bird colony, an interesting place to view wild life. A ledge extends 100m from the island on the south east side and the currents can be strong. On the shore line northeast of Amarillo are very hot springs with the possibility of a daytime anchorage, depending on the weather. The sight of the Andes to the east of Bahía San Quentin has been described as one of the most spectacular views of the region. Four anchorages are mentioned in various pilots but we have no firsthand information about them. These anchorages are Caleta San Tomás (46°52'S 74°25'W), Caleta Barrancos (46°51'S 74°29'W), Puerto Covadonga (46°46'-5S 74°36'W) and Puerto Angamos (46°45'S 74°30'-5W). 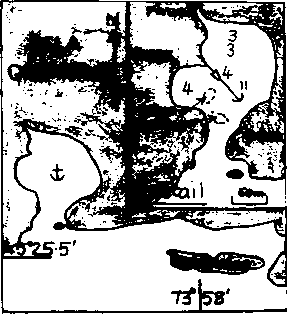 A fifth, marked on chart 816 off the northwestern shore of Peninsula Forelius at 46°49'5S 74°36'-6W, has for some reason failed to find favour with visitors. If working north and it has been found advisable to pass through Canal Cheap, one of the Bahía Quentin anchorages will provide respite. It is about 67M from Cabo Ráper to Isla San Pedro across the Gulf of Penas which has a reputation for bad weather and deserves considerable respect. The bay is shallow and frequently subjected to cross swells that can kick up a very nasty sea. The most logical timing of a crossing from north to south is to leave Bahía San Andres shortly after the passage of a warm front with the wind veering from the north to northwest though this may be accompanied by rain and poor visibility. But a light southwest wind can give good conditions for a north-south crossing. 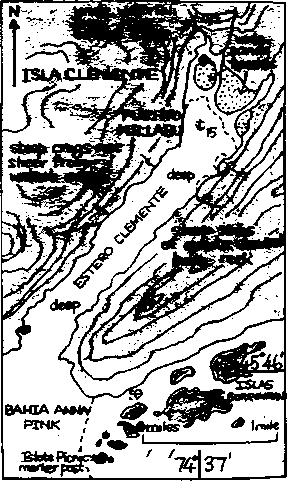 The trip should be timed so as to arrive at the entrance of the Messier Canal in daylight; though it is five miles wide, there is considerable foul ground to the northwest of San Pedro Light and an error in navigation could be disastrous. If the tide is ebbing out of the Canal, the seas in the entrance can be very confused. The crossing from south to north is usually less of a problem as long as it is timed for a period of west to southwest winds and there is the alternative of Canal Darwin if Bahía Anna Pink looks difficult. 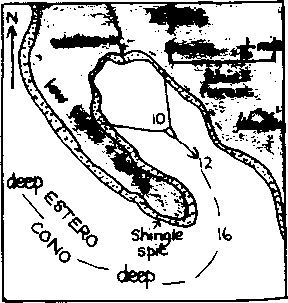 There are a number of anchorages in the immediate area of the entrance of the Messier Canal; Puerto Escondido between Isla Wager and Isla Schroder, Caleta Ideal and Caleta Chica at the southwest corner of Isla Schroder, Puerto Francisco on the eastern side of the entrance in Seno Baker, and Caleta Hale on Isla Orlebar 17 miles south of San Pedro Light. Both Ráper and San Pedro will give forecasts if asked and will also advise on local conditions.